The first thing you need to do is get your hands on is a bin. You can purchase pre-made worm bins via mail order fairly inexpensively; you can also make your own out of a plastic storage bin or wooden crate. No matter which type you go with, keep in mind that its size should correlate to how much food waste your household generates. If you generate 1/2 a pound of food waste per day (generally, for a family of two), your worm bin should measure at least four feet in surface area (a 2' x 2' bin), and you should fill it with one pound of worms. If you generate 1 pound of food waste per day (typical for a family of four) either go with two 2' x 2' bins, each with a pound of worms or find or make a bin that is at least 3' x 3' and fill it with two pounds of worms. Keep in mind that the bin does not need to be very deep. Red worms live and eat in the top six to eight inches of material. We see all of those lovely earthworms out in the garden, and we know that they're doing a great job aerating the soil, breaking down organic matter, and leaving rich castings behind, so it seems that they would be perfect for a vermicompost bin. While you can try working with these types of worms, your level of success would be much higher if you used one of the two varieties of worms that are specifically raised for vermicomposting. Eisenia fetida and Lumbricus rubellus are both used successfully in vermicomposting, and these are the worms that you receive when you order worms for vermicomposting. 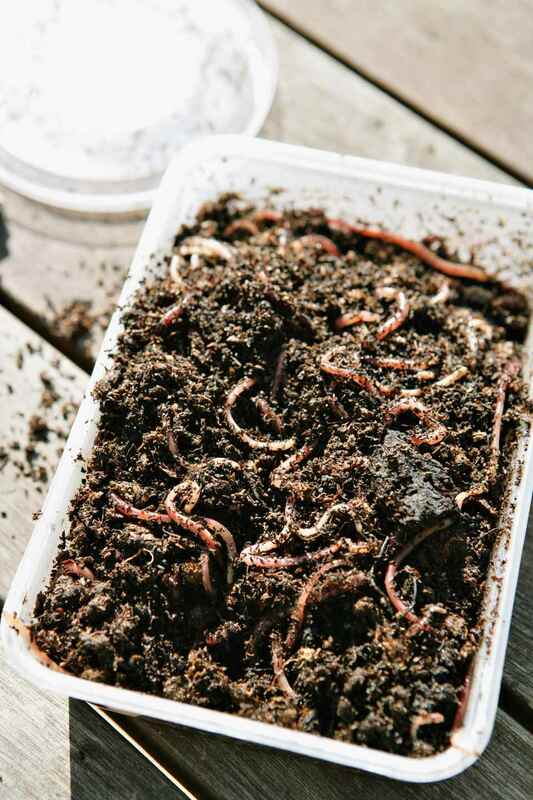 The difference between composting worms and earthworms are that composting worms do a fast job of breaking down organic matter from beginning to end. Earthworms are much more effective at further breaking down organic matter that has already decomposed somewhat. Go with redworms, or red wigglers, as they are also known, for a successful worm bin. So, you have your bin, you've ordered the right kind of worms, and you're ready to start setting up the bin. The first thing you need to consider is bedding materials. The most commonly used bedding material is newspaper, mostly because it is so readily available. Cardboard, coir, and peat are also good bedding materials. If you are using newspaper, shred about 50 sheets into thin (one inch wide) strips. If you are using cardboard, tear it up into fairly small pieces. Worms will not survive in a dry environment, so you'll need to moisten the bedding materials to get them off to a healthy start. Place your bedding material into a clean bucket or tub and start adding water. It is best to use dechlorinated water for your worms. To dechlorinate your water, simply fill a couple of jugs or pitchers of water from your faucet and leave them sitting out, open, for a day or two. The chlorine in the water will dissipate, leaving your water free of chlorine. To moisten the bedding, simply add the bedding material to a clean bucket or tub and start pouring water in. Mix it into the bedding well, adding a little at a time. You want your bedding material to feel like a wrung-out sponge. A couple of drops should be released from the bedding if you squeeze a handful of it; if more water drips out, add a bit more dry bedding to get the moisture levels right. Once the bedding is right, dump it into the bin, fluffing it up a bit. You want your worms to be able to wriggle easily through the bedding. Break up any large clumps of bedding. If it is at all possible, add a shovelful of garden soil or finished compost to your bedding material. It will provide grit for the worms, as well as introduce microorganisms that will help the contents of your worm bin break down faster. It is a very good idea to wear gloves for this step unless you like the look of ink-stained fingernails. Once you've moistened the bedding and placed it into your bin, your worm bin is ready for the worms. Scatter them gently onto the bedding, and cover up the bin. Let it sit a few days without adding food so that the worms work their way down into the bedding. Once a couple of days have gone by, your worms are ready to go to work. Where you place, your bin is important. The bin should be kept in an area that stays between 55, and 80 F. Temperatures outside of this range can be detrimental to the worms and slow production in the bin. Worms are also bothered by vibration and may try to escape the bin if this is an issue. Try not to place the bin near washing machines, clothes dryers, or dishwashers. The final consideration in placing the bin is convenience. You want the bin to be in a place where adding food waste will be easy, and you will frequently be reminded to check conditions in the bin to ensure that your worms are happy. Every household is different, but prime spots include kitchen cabinets, mudrooms, and basements.